currently under construction at Katy. Sales for available units range in price from $234,990 to $460,000. Young Ranch unit sizes range from 1828 to 4377 square feet. 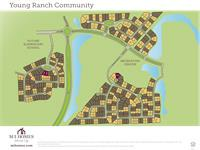 Young Ranch has a total of 28 quick move-in homes currently for sale. Young Ranch is a master-planned community with a small town feel with an abundance of eating, cultural, shopping and entertainment offerings. This resort-style community in Katy features a state-of-the-art recreation center with outdoor kitchen, meeting room, and fitness area. There's truly something for everyone with the multi-function swimming pool, a zero-entry beach area, traditional play space, and a splash pad. With so many features, you'll never run out of things to do in this lively community! Within this Fort Bend and Waller County community, you will have the choice of single-family detached homes situated on 55 ft., 60 ft., or 80 ft. lots! Many of these lots are located on cul-de-sacs or back up to green space. As a part of Katy ISD and Lamar CISD, this community of new homes is perfect for growing families. If you're looking for easy access to major interstates, schools, and entertainment while remaining tucked away in an enviable setting, Young Ranch is the place for you! Your inquiry will be delivered to the Young Ranch sales team, who will send you more information about this development.